Before you start to read this article, you need to know how to set up the environment of monkeyrunner. If you don't know how to do it, you can read my another article at http://android-test-tw.blogspot.com/2012/10/android-automation-test-by-monkeyrunner.html in this blog in advance. Let's brief Jython Script for monkeyrunner below before we go over next section. The variable for Jython language, it can manipulate several type of variable such as Number, String, and List. The variable in Jython doesn't need to be declared. All you have to do is to assign to value to it. Let's take a look some simple example and description below. You can copy the script to a text file and save it to a file named example.py (file name can be any valid file name in your system). Open a cmd window and type monkeyrunner.bat example.py and press enter key on your computer. Assign a list to a variable. 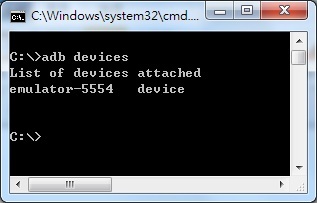 First, you need to bring up a cmd window on windows operation system and attach your Android device to computer and check if the computer can detect you ADB interface of Android powered device. In this example we want to verify the result of run-time image and make decision for next action. At this case, we need to add logic statement in monkeyrunner. The logic script refers Jython Script. However we can refer to Python script tutorial for writing statement because Jython uses the same script with Python. Note, not all the Python script and components/class you can use on monkeyrunner. However you can try to use it. Following example shows you how to turn on Bluetooth radio on your Android device and check the UI (user interface) if Radio icon has set to Bluetooth On. And turn off Bluetooth radio. The goal is to perform turn on and off Bluetooth Radio repeatedly and check the result by UI. In order to compare the screenshot for the testing result, we need to get a screenshot for pass criteria. We can use MonkeyRunner to get the screenshot by Jython script. The piece of script is as follows. The screenshot of Bluetooth On below was captured at settings/wireless screen on Android device and ran the above script. Note, the screen resolution is 240x432 and OS version is 4.1 in emulator. #Import class of MonkeyRunner, MonkeyDevice, and MonkeyImage. #Connect Android device from computer and assign handler to variable -device1. #Get specified rectangle from screenshot got by last step for the result we want to check and assign handler to variable monkeyimage2 again. #Compare the result if both images of pre-loaded and run-time screenshot are the same.